We are providing this information as a benefit to our customers. If you have detailed questions concerning licensing, please give us a call. This information is only applicable to customers using two-way radios within the United States. Read 'Understanding FCC Bands' under our 'FCC Radio License' section of Help on this website to become familiar with the primary FCC service types used for two-way radios. This will help you determine which service is appropriate for your usage before proceeding with your application. GMRS is for individuals and their family members. For non-commercial use only. Is a more powerful service for individuals than FRS. Handheld radios can be up to 5 watts. Repeaters are allowed with some limitations. 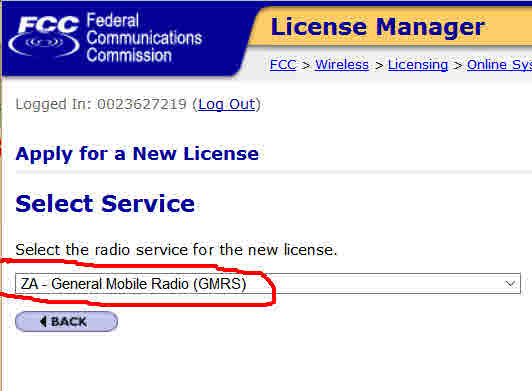 GMRS requires a license. One license covers the entire family. You must be 18 years or older to apply for the license, but anyone within your family (regardless of age) can use the radios. You can only transmit on frequencies designated for GMRS (see list below). You must stay within the power limitations assigned for each frequency (see list below). 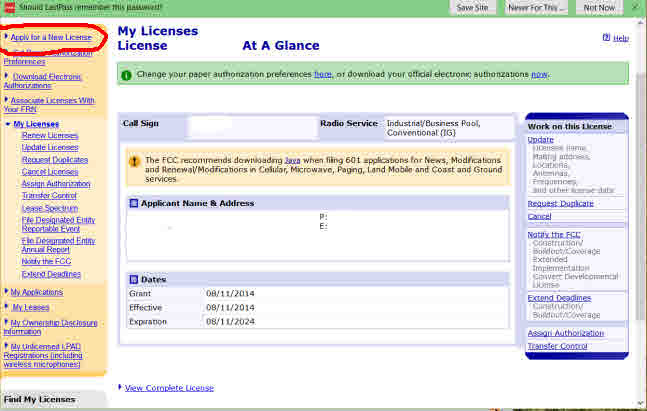 To use GRMS frequencies, the FCC requires you to obtain a license. To get a license you don’t have to take an exam, but you will need to fill out the required forms and send your payment. 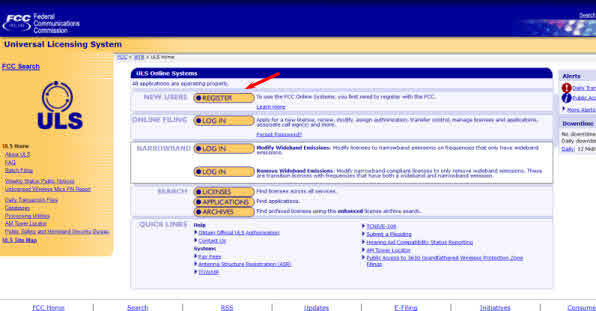 First, you must obtain an FRN number (FCC Registration Number). There is no charge to obtain an FRN. However, there is a fee when you apply for your license. 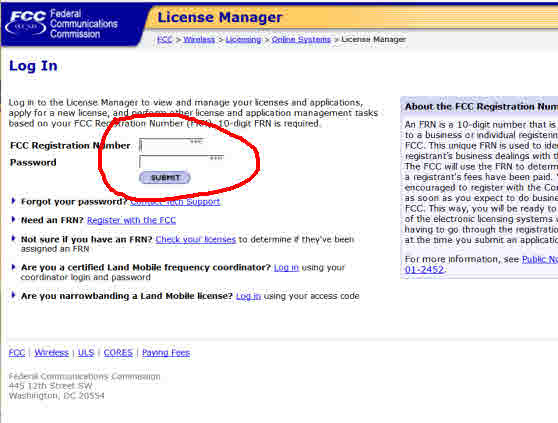 To get your FRN, go to the FCC Universal Licensing System . Select "Register" on the ULS Home page, complete the online questionnaire. You will receive your FRN immediately upon completing the one-page online form. Then you can move to the next steps below. The process to obtain a GMRS license is fairly easy. You can apply for a license online by following the steps below. 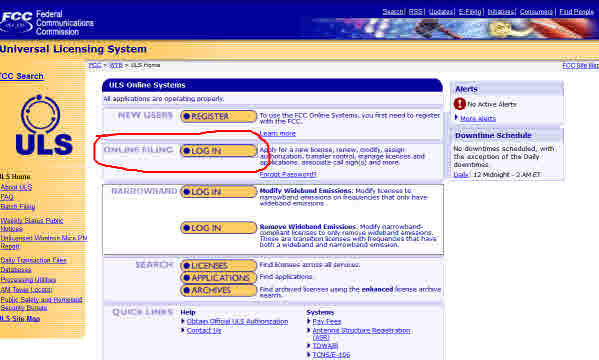 Once you have your FRN (see "Obtaining an FRN" in the previous paragraph) from the main FCC screen choose "Online Filing, Log In". Follow the screen pages below. Login using your FRN and password. Complete your application by filling out the information. Continue to the certification section, and certify your information is true and correct. You should become familiar with the rules and etiquette of two-way radio and GMRS. You should memorize your call sign and be able to provide it when asked by other users.